This week’s tool is a Rent vs. Buy tool for those negotiating the questionable real estate landscape these days. 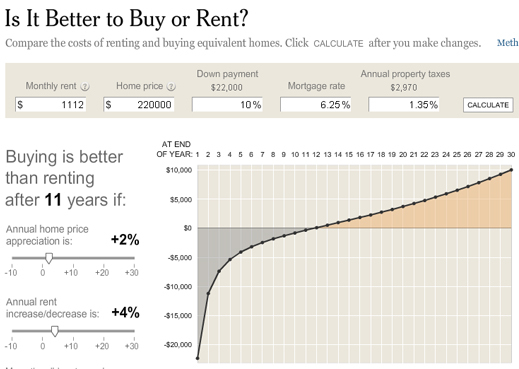 Users of the tool can easily compare the costs of renting and buying equivalent homes. Once again it reminds of the potential for branded utility tools like this. Stuff that is so useful and valuable that the world can’t help but forward it to on. This one’s from the NY Times, and unless you register, you can’t enjoy it. It’s a great way to create value for the NY Times media brand. But I still don’t understand why more marketers aren’t aggressively driving this kind of branded utility tool. Shouldn’t this be brought to us, for free, by one of the global banks? Entry filed under: branded utility, trends, visualization, world.